Fall Out Boy on stage. Fall Out Boy (often shortened to FOB) is an alternative rock band, that make music, from Chicago, Illinois, USA. The members are Pete Wentz (bassist), Patrick Stump (vocals), Andy Hurley (drums), and Joe Trohman (guitar). They have written successful songs, including "Thnks fr the Mmrs", "Sugar, We're Goin' Down" and "Dance, Dance". Their music is mostly like the pop-punk style, or genre, of music. The band got the name "Fall Out Boy" from a character who appeared in one episode of The Simpsons. "Sugar, We're Goin' Down" was the first single from their album From Under the Cork Tree. It has peaked at number eight on the Billboard charts. The second single was "Dance, Dance" which picked up major airplay in the U.S. The third single was "A Little Less Sixteen Candles, a Little More Touch Me." Their third album is Infinity on High and it had lots of success around the world. Two songs from the album were very popular across the world. They are "This Ain't a Scene, It's an Arms Race" and "Thnks fr th Mmrs". The second song's title is "Thanks for the Memories" without the vowel letters, which is meant to look as if it were from a text message. 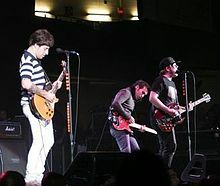 The third single from Infinity on High is called "The Take Over, The Breaks Over". The fourth is "I'm Like a Lawyer With the Way I'm Always Trying to Get You Off (Me & You)". Their fourth album Folie à Deux, was released on December 16, 2008. "I Don't Care" was the first song released from the album. In late 2009 the band took a rest. Patrick Stump went solo and released his debut album Soul Punk on October 18, 2011. His EP Truant Wave was released on February 22, 2011. Bassist Pete Wentz formed the electro-pop band Black Cards. Guitarist Joe Trohman and Andy Hurley formed a rock band The Damned Things with people from Anthrax and Every Time I Die. Fall Out Boy came off hiatus in 2013, releasing a new single "My Songs Know What You Did in the Dark (Light 'Em Up)" and an album Save Rock and Roll, along with a supporting tour. They went on the Save Rock and Roll Arena Fall Tour September of 2013 with fellow rock band Panic! at the Disco in support of the album as well. In September 2014, they released a new single, called "Centuries". ↑ Fall Out Boy biography. Rolling Stone. Retrieved on 21 February, 2010. ↑ "Fall Out Boy's Sugar Rush : Rolling Stone". Rolling Stone. Retrieved 2010-02-21. ↑ "Fall Out Boy's 'Centuries' is Here AND DAMN : MTV". MTV. Retrieved 2014-09-20. ↑ Stephen Thomas Erlewine. "Fall Out Boy - Pax-Am Days". www.allmusic.com. p. mw0002585504. Retrieved 4 March 2019. ↑ "Fall Out Boy ‎– Pax-AM Days". www.discogs.com. p. r5148207. Retrieved 4 March 2019. This page was last changed on 4 March 2019, at 15:10.